Ben’s parents gravitated naturally to the idea of establishing a micro-enterprise for Ben once his home-schooling was completed. Debby asserts ‘we wanted a business because we didn’t want to see Ben working at a recycling depot’.Ben had been involved in a rock band program offered by a local music supply store. Many of the participants were hesitant to perform, but Ben had a ‘bring it on’ attitude when it came to grabbing the mic, and belting it out. He also proved to be a natural drummer.One day, the light came on. Debby turned to Ben and asked ‘would you like to be an entertainer?’ He looked back it her as if it was an obvious truth. Ben Simcoe has been ‘doing voices’ for most of his life. From cartoon characters, to political figures, and from songs to movies, impressions are a normal part of the 27 year-old’s communication style. Impressions, etc. was born. The two went to work cataloguing how many ‘voices’ Ben could do… and came up with a whopping ‘opening inventory’ of 85 voices, including some that culled personalities from Ben’s related love of karaoke. Having audiences weep with laughter and with heartfelt emotion (particularly during Ben’s rendition of Louis Armstrong’s ‘It’s a Wonderful World’) is not uncommon at the 15-minute performances, which Ben loves to deliver. He is eager to book even more engagements, which now number a few each month. Recently, he took his first plane trip to deliver two performances in Kelowna (Ben is obsessed with airplanes) and wants to continue that flying trend. Through word-of-mouth, including active referrals from Matt’s parents, Matt is engaged in jobs that included moving, junk removal, landscaping, small repair jobs, and as Joey describes it ‘anything else odd’. 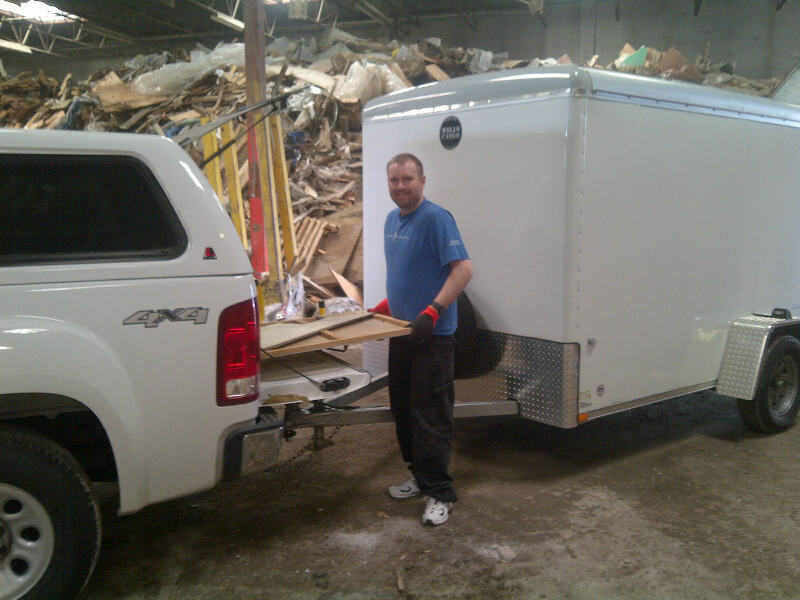 After launching several years ago, with funds generated from the business, Matt purchased his first business asset—a $400 used trailer, which Matt and Joey then rebuilt from the ground up. Since then, with the financial backing of Matt’s parents, a new enclosed trailer has been added, which is pulled by a truck supplied by LACL. Now six years into the business, they are contemplating a website (or perhaps a page on LACL’s own website), printed marketing materials, and strategic postings on Craigslist. Remembers Joey, ‘Matt was a complex individual to support behaviourally back then’. He was prone to angry outbursts and agitation. LACL staff, led by Joey, used self-employment as a positive behavioural support, setting the bar high, and communicating to Matt that calm behavior leads to good work, which results in being paid for a job well done. Feedback from friends and family reflected that the new Matt was happier, less frustrated, more social, and friendlier. As interactions with clients continued, Joey noticed that Matt became better able to sustain longer conversations with less effort, was more engaged in friendships, and seemed generally happier overall. In addition, Matt is viewed as a member of the broader community, and is appreciated by people who have been helped by him: Matt is proud of doing a good job for folks. In addition to supporting his love of fitness and sport, Matt saves his business profits for recreational activities, including a Vegas trip, summer camping outings with friends, and restaurant meals. He is currently saving to go on a cruise.